The Jamaican sprinter Usain Bolt has been named IAAF World Male Athlete of the Year. 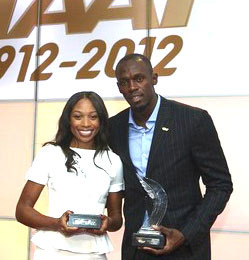 United States sprinter Allyson Felix has copped the title, World Female Athlete of the Year, while Bolt’s coach Glen Mills has received an achievement award as lifetime coach. The Jamaican sprinter, who defended his 100 and 200 meter gold medals at this summer's Olympic Games, had previously won the award in 2008, 2009, and 2011. The awards were announced on the final day of the IAAF's 100th anniversary celebration.